Strength in home prices and in the stock market reinforce the “wealth effect” that leads to more spending, which in turn boosts the general economy. The US and the world need the growth in demand. Notice that all three curves were “zeroed” at January 1, 2000, so differences in the way the last market cycle and the housing downturn were experienced are quite visible. 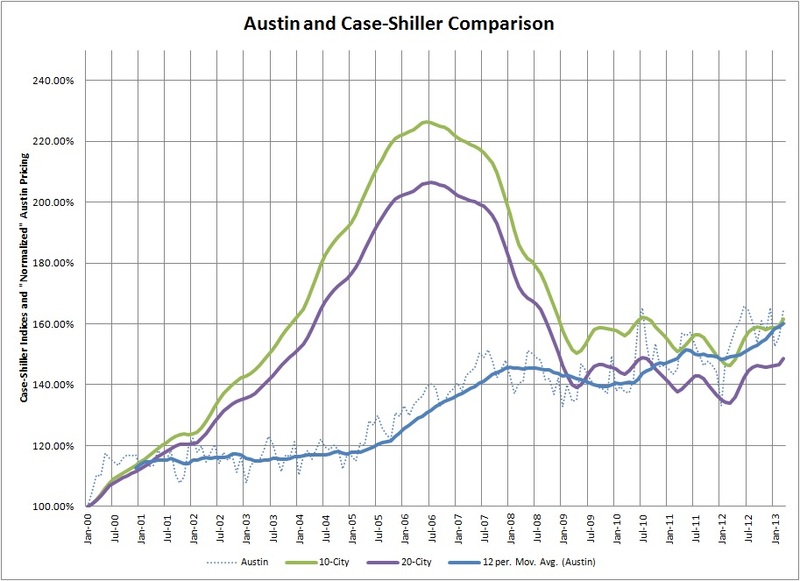 As of March 2013, accumulated price appreciation in the Austin metropolitan area almost exactly matched the Case-Shiller 10-city price index, and exceeded growth of the 20-city index. The obvious difference was the bubble that burst in 2006, and the much-discussed damage done in the process. 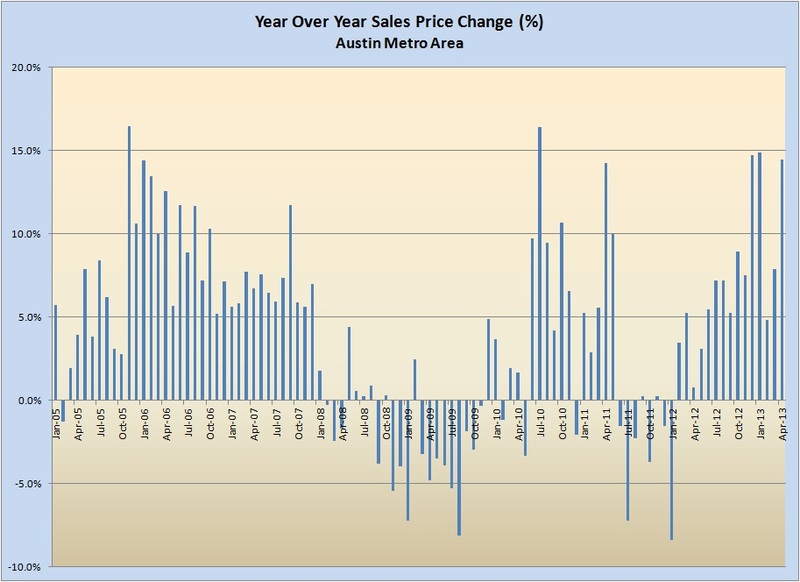 Click that chart to enlarge it, and you’ll see that the Austin area has seen 23 months of annual price gains. Note, too, that the worst year-to-year price declines here were in the 8% range. Compare those to the non-stop slide from 2006 to 2009 in the Case-Shiller cities. Another bubble forming? So far that doesn’t appear to be the case. In Austin and Central Texas particularly, underlying economic and employment growth are tremendous, and with a more stable national economy there is good reason for optimism. Bravo on the continued great posts. Would you mind if I gave you credit for this chart and used your case shiller chart? CONFIDENTIALITY NOTICE: This email transmission is covered by the Electronic Communications Privacy Act, 18 U.S.C. 2510 et seq., and the information contained in this message and documents accompanying same are legally privileged and confidential information intended only for the use of the individual or entity named above. If the reader of this message is not the intended recipient, you are hereby notified that any dissemination, distribution or copy of this message is strictly prohibited. If you received this message in error, please immediately notify us by telephone and purge all copies of this message from your system. Thank you.